Iâ€™ve been using the beta of Evernote 8.0 for a few months now, and this really does feel like the best version of the app that they have ever released. There have been numerous redesigns over the years, but each of them felt like they were following design trends, instead of making the note-taking experience faster or more intuitive. Thankfully, they really got it right this time with this new bottom bar. There are tabs for Notes, Search, Shortcuts, and Account settings. The â€œ+â€ button is place smack dab in the middle and highlighted in green, so it always stands out, and itâ€™s very obvious how to quickly create a new note. The Evernote team paid a lot of attention to the details, and there are great little gestures and shortcuts for power users. Tapping on the Notes tab will show my notes, but tapping on the tab one more time will scroll me all the way back to the top, revealing controls for searching, switching notebooks, or filtering by tags or reminders. The only thing faster would have been some tap and hold gesture on the Notes tab itself â€” but that probably wouldnâ€™t have been as discoverable. When Iâ€™m browsing notes, the name of the current notebook is always displayed at the top of the screen, so Iâ€™ve always got an idea of where I am in my collection. There are are no more note thumbnails, but you can choose different sizes of cards (with varying amounts of text and images showing in the preview). 3D Touching a note doesnâ€™t seem to do anything any more, but I have a feeling theyâ€™ll be reintroducing or repurposing this gesture over time. The Search tab is also very well executed: tapping on the magnifying glass icon will bring up the search screen, with the keyboard already loaded. Many other apps, including Appleâ€™s own Notes app, require you to scroll up to reveal the search bar, and then tap on it to bring up the keyboard. 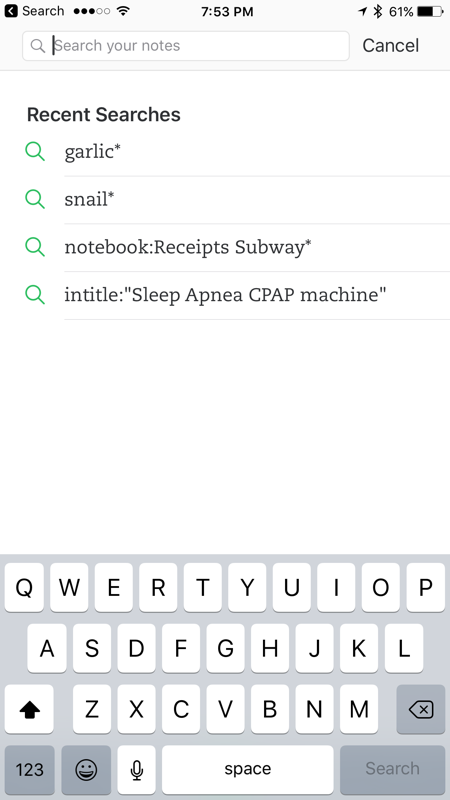 I really appreciate Evernote saving me a tap, but I love how swiping down during a search will help me dismiss it. Any time that an app saves me from reaching for the top of the iPhoneâ€™s screen is a big win in my book. I think touch controls should be placed towards the bottom of the screen whenever possible because itâ€™s just easier for me to reach, and Evernote 8.0 seems to subscribe to this idea as well. 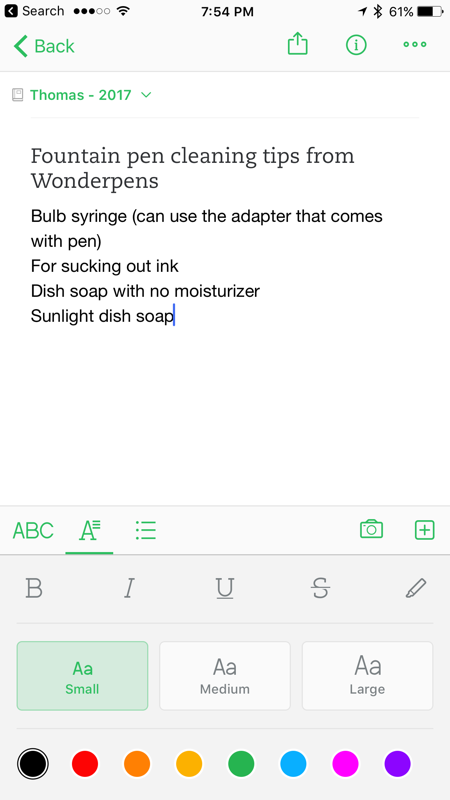 The pop-up formatting controls in previous versions were passable, but Evernote 8.0 embeds them in the keyboard section, as scrollable buttons. I really like this change: itâ€™s a lot easier to choose between font and paragraph formatting, and the tap targets are a lot larger overall. If you were tired of trying to hit a very tiny button just to bold your text or activate bullet points, youâ€™ll love Evernote 8.0. The only thing I think is missing is the ability to select text and turn it into a hyperlink. I like to keep my notes clean, but Evernote on iOS requires that I paste an entire URL into the note before it becomes parsable as a link. Thatâ€™s just silly at this point. One of Evernoteâ€™s long-standing problems was that formatting could change pretty drastically across various platforms. A beautiful note created on the Mac could be illegible on the iPhone because of the way formatting was handled on iOS. After a few months of testing, Iâ€™m happy to say this no longer seems to be an issue for me. Iâ€™ve done a lot of iOS and Mac note-taking in the past few months â€” simply because Iâ€™m using my Mac for work these days â€” and I havenâ€™t faced any trouble reading notes on the iPhone. This is a really big deal, and itâ€™s great to see Evernote treating note-taking and consistency as a pillar of the service. If you havenâ€™t tried Evernote â€” or if it has simply been a while and youâ€™ve jumped to other services â€” Iâ€™d recommend giving this v8.0 update a try. Itâ€™s a large improvement for note access and writing on the platform, and I canâ€™t wait to see where they take Evernote next. No thank you. They lost me in 2016 with their antics.